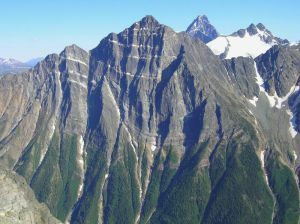 Mount MacDonald is located immediately east of Rogers Pass. Its north face drops straight to the highway north of Rogers Pass. The Connaught Tunnel takes the Canadian Pacific Railway right under the entire mountain, thus bypassing Rogers Pass. In the 1990's a second and longer, lower railway tunnel has also been completed. Mount MacDonald was originally called Mount Carroll, but was renamed in honor of Sir John A. MacDonald, the first Prime Minister of Canada. The towering complex north face of Mt MacDonald is one of the major walls in the Selkirks, it rises 1700m above the Trans Canada Highway. To reach the north face it is necessary to cross Connaught creek. This creek crossing may be difficult with high water, at present a log below the second snowshed (from the west) provides a crossing point. There are numerous recorded routes all around the mountain ranging from class 3 to V 5.8 A3.